Although I have a sweet tooth, I have never really been a fan of donuts, I find them too sweet, they make me nauseous. Though I have fond memories of donuts from my chidhood (my uncle used to surprise us with a big box of dunkin donuts everytime he visited us), it is one sweet that I never really sought out myself. 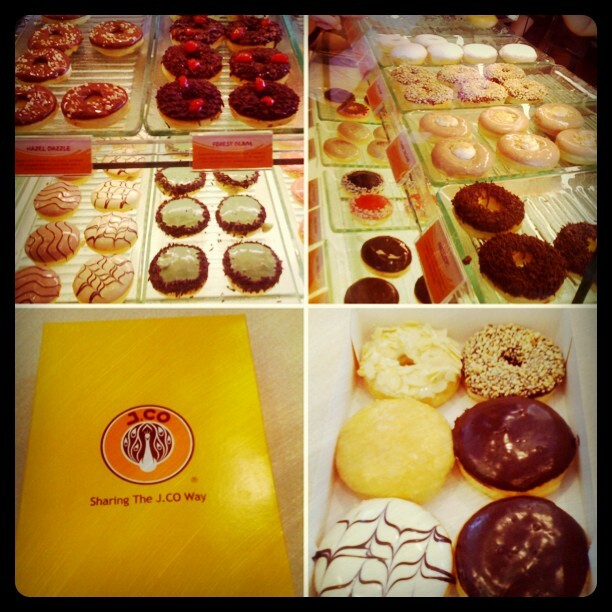 But then, about two years ago while vacationing in Singapore, my friend surprised us with a box of J.Co Donuts. I fell in love with these little sugar soldiers instantly. They come in assorted flavors that are oh so delicious, flavors like Choco Caviar Chocolate, Cheese Me Up, Mango Blitz, Tiramisu etc. All of them are hands down, yumeee! I like how the donut bread manages to stay soft even after being refrigerated and I like how they’re not so overly sweet. Two weeks ago, I learned that J.CO opened a store at SM MOA, and I must say, I really sought out the store this time as I wanted to have a taste of these sweet charmers again. I went home happy with my box of J. Co Donuts. They are affodable at 42/piece, 230/6 pieces, 350/1 dozen, and 550/2 dozens. Now I can’t wait for their store in ATC to open so I can get my sweet fix anytime I want to since it is much nearer my place of work. What about you what’s your latest sweet fix? Me too! I have been hearing so much about these donuts from my friends, but never got a chance to taste it. I really feel bad whenever I see posts about J.Co. Until now I havent gotten the chance to taste it. I feel like ako na lng di nakaka kain ng j.co. Hay! At ska a big box of jco for blancnotes! More than 500 fb likes n 🙂 gratz ! I love their donuts. They have a large selection of donuts from a variety of shapes, flavors and prices. but I think it’s a bit more expensive. Haven’t tried J Co. but I’ve had an awful craving for Krispy Kremes for several years. SM Davao finally opened up a franchise. Happy happy. enough to cover it well everything you’ve borrowed. already have one. A slightly more surprising finding was that just as many women as men stated that they were likely to purchase Christmas gifts online. This year I got a fabulous (expensive) coat for free with a single purchase from a mail-order catalogue. to access. Every comic or craft is methodically analyzed and designed so that kids learn useful skills for their life. is the most reasonably priced with 1080p capability. experience has made the social media giant to be mindful of downtime issues of its valued social app developers. trying to in finding tbings to imkprove my website!I suppose its good enough to mmake use of some of your ideas!! as with the layout on your blog. thanks for sharing thanks a lot.. This was the only familiar food store i saw in Batam, Indonesia. Sweet desserts. Thanks for the awesome post. Thanks for publishing such an helpful post and your post helps in me in getting more better results from it. My android app cleanup master helps your android phone to junk clean, provides antivirus, good battery saver, enjoy great game booster.